We do not want to mess with Spencer! Check out the look on her face in this summer finale scene. It's back to the police station on the Pretty Little Liars summer finale. The girls find themselves up against a former enemy. 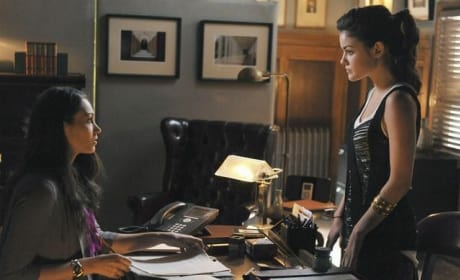 Aria and Spencer confer here on "Over My Dead Body." It's the summer finale of Pretty Little Liars. This can't be good, huh? Emily is brought in to see her friends during the summer finale of Pretty Little Liars. The girls square off against the police on the Pretty Little Liars midseason finale. It's titled "Over My Dead Body."